I've facebook'd it, I've tweeted it, and now I'm blogging it. You may have seen this news already if you're a WWD reader, or read the recap on Racked NY, but I had to share again as H&M's official press release is titled: H&M TO OPEN MONUMENTAL STORE IN HERALD SQUARE. I really love the word "monumental." 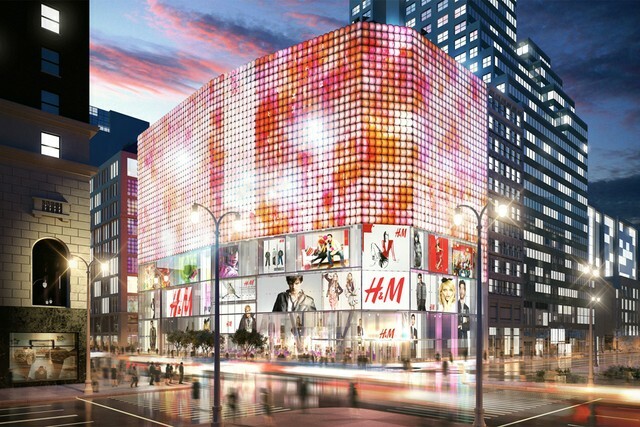 H&M is projecting a Fall 2014 opening for what will be the world's biggest H&M flagship, with four floors and 63,000 square feet of H&M brands, including their home collection. Herald Center was rumored to be getting Topshop, remember? Well, they're going to have to go somewhere else on 34th Street now, because H&M will be taking over Herald Center. The retailer says it is not closing or changing the concept of their other two stores on 34th Street, so there will be three H&Ms all in very close proximity (34th and Broadway), or down one long city block (34th and Seventh Avenue). Welcome, again, H&M, to 34th Street Herald Square.